Explore the origins of Madrid on this 3-hour walking tour, and learn the history of the Spanish capital from its foundation by the Muslims to the arrival of the Bourbon Dynasty. Discover the narrow streets of the Old Town and hear fascinating stories about Madrid history, in lieu of boring facts and figures. Marvel at the majestic Royal Palace of Madrid. Take a our 3-hour walking tour through the heart of Madrid, and learn how the Spanish capital became one of the most important cities in Europe. Marvel at the Hapsburg era (16th and 17th centuries) and admire the Spanish baroque: Plaza Mayor, Bakery House, Plaza de la Villa, etc. Among the tangle of streets, discover top attractions such as Puerta del Sol Square, the Royal Post Office, San Miguel Market or the oldest restaurant in the world. All of this accompanied by legends and interesting facts about Spanish culture: traditions, food, local customs, tips and much more. The narrow streets of the Old Town will take us to the Bourbon Madrid where we will find majestic buildings such as The Royal Palace, the Almudena Cathedral or the Royal Theatre. Here the French influence of the Bourbon dynasty is more than evident. 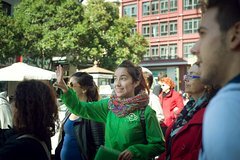 This tour gives you a great overview about Madrid history from its foundation to the 20th century.